Avid birders Randy Beaton and Sid England enjoy travelling the world to expand their avian expertise. This passion requires a low-maintenance garden that takes care of itself much of the time. 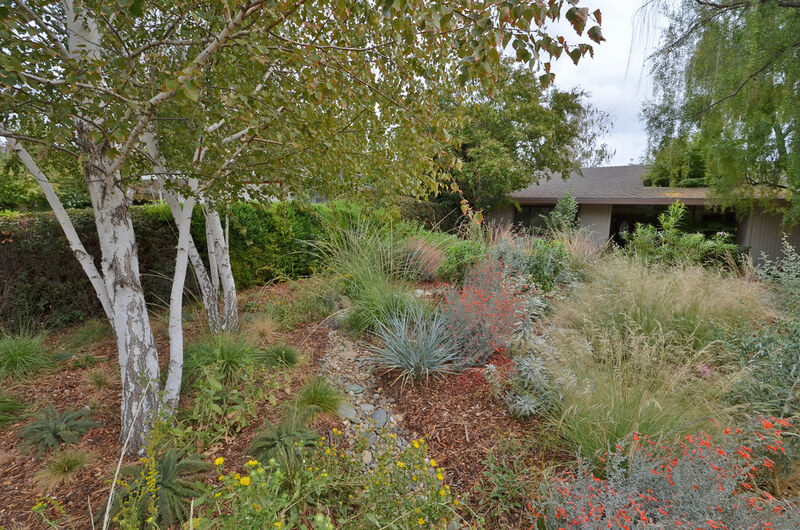 They also wanted to create a front yard that would support native creatures and what better way than by using native California plants. Native plants have natural connections with native insects and birds by providing them the food they need in the form of nectar, pollen and fruit. “We feel our garden is successful because it not only looks nice year round, but it has attracted native birds and insects all while needing much less water,” says Beaton. Soft textured grasses like deer grass (Muhlenbergia rigens), Canyon Prince fescue (Leymus condensatus ‘Canyon Prince’), and give the garden motion and soft texture while providing seed for birds and cover for insects which increases the food supply for insectivorous birds like warblers. Also, perennial grasses provide cover for bumblebees to make their nests. “We always hated the lawn so had been planning to replace it with a garden for a while, then the drought worsened and finally the State implemented the program to subsidize taking out lawn to replace it with a water-wise landscape. That motivated us to make the change,“ continues Beaton. Plants like gumweed (Grindelia), a Central Valley native, and buckwheats (Eriogonum arborescens) need little water. They also provide food in the form of nectar and pollen for pollinators and aphid-eating beneficial insects. Native sage, like Cleveland sage (Salvia clevelandii) and white sage (Salvia apiana) create a silver and grey structure that grows year-round – the perfect backdrop for herbaceous, hummingbird-friendly perennials that grow seasonally like California fuchsia (Epilobium canum). “Our advice to other gardeners? We thought our turf grass was dead, but it wasn’t, so that’s been a nagging problem. Make sure to kill your grass and till it before moving forward with replacing it. Also, choose a good contractor to help you implement your ideas. Make sure they understand your vision or can help you develop a vision,” says Beaton.